The organisation says it wants to observe whether or not both sides “play fair”. A CANADIAN-BASED NGO plans to send an ‘observation team’ to Ireland to monitor the upcoming referendum on the Eighth Amendment. Sustainable Development Assistance International (SDAI) intends to send 20-24 people, working in teams of two, to several locations throughout Ireland both before and after the vote on 25 May. Ireland nominates citizens for international election observation missions, as part of its commitment to human rights and democracy, but it’s more unusual (although not unheard of) for an international group to observe an election or referendum here. Observers are involved in overseeing and monitoring the election process to ensure that it is fair and impartial. In 2017 Ireland sent citizens on election observation missions, overseen by the European Union or the Organization for Security and Co-operation in Europe, in countries such as Armenia, Turkey, Kosovo and Kenya. Karen Reinhardt, executive director of SDAI, said the organisation has received applications from about 40 interested people – from Europe, the US and Canada – for the Irish mission to date. She said the group doesn’t have a preference for the outcome of the referendum. Neither myself, nor our organisation, nor our observers, have a preference for the outcome of the referendum. We are concerned with the process, not the outcome, which is solely a matter for the Irish people. The mission is expected to last five days – observers will receive a briefing and training on 23 May and stay in Ireland until 27 May. “After the briefing and training, they will move to the areas of the country that they will observe in, to familiarise themselves with their area of observation. On referendum day they will spend the day in several polling stations, to observe and report on the activities there,” she said. SDAI has not finalised exactly where the observers will visit but Reinhardt said the group plans “to cover as wide an area as possible”. “Any election or referendum observation mission is only able cover a relatively small sample of the country. One important point is to cover as balanced a mix as possible of rural and urban areas,” Reinhardt said, adding that SDAI has made “initial contact with relevant electoral bodies”. She also noted certain media coverage about “one or the other side blaming each other of various infractions or unfair advantage” and “allegations from both sides about money from abroad trying to influence the vote”. SDAI is aiming to raise $7,000 (about €4,500) online to pay for elements of the initiative. At the time of publication, it had raised over $700 (about €450). Individual observers are paying for their transportation to and from Ireland, accommodation and meals, Reinhardt said. Some of the money will also be spent on organising presentations from “experts in areas relating to the referendum” as part of the observers’ training, as well as venue costs and in-country transportation costs. No specific experts have been confirmed as of yet. This is the first time SDAI has observed an election or referendum. Reinhardt said the organisation considered sending an observation team to Ireland at the time of the Marriage Equality Referendum in 2015, but “decided against it as there were already other groups committed”. Reinhardt told us impartial election observation is “an internationally accepted method of measuring, against internationally accepted standards, the implementation of electoral legislation at an electoral event”. “One of the pillars of SDAI’s mandate is that of democracy support. Democracy support can take many forms, one of which is the observation of elections. This referendum is an important one for Ireland, and SDAI’s presence as an impartial observation group will, hopefully, increase the confidence of the Irish people in the result. “Oftentimes, simply the presence of an impartial group of international observers gives citizens a sense that the international community cares about what happens in the country. “While Ireland does not have a history of fraudulent behaviour in polling stations, observation can be considered to be a positive reinforcement of the general principles of free, fair and transparent elections,” she said. A spokesperson for the Department of Housing, Planning and Local Government confirmed that SDAI “has been in touch with the Department recently in relation to sending observers to the referendum”. “Similar NGO groups have visited during elections and referendums in the past, and this is a normal part of the democratic process,” they told us. When asked about SDAI’s plans, a spokesperson said the Referendum Commission “has no role in this”. “Our role is set out in law and is to explain a referendum proposal, to promote public awareness of a referendum and to encourage people to vote,” they added. 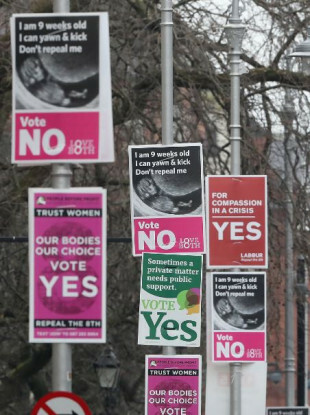 A spokesperson for Save the 8th, which is in favour of retaining the Eighth Amendment, said the group “believes that the Irish electoral system is free, transparent, fair, and honest” and “there is no need for international observers”. Together for Yes, which is campaigning for the Eighth to be repealed, had not replied to a request for comment at the time of publication. Email “Canadian NGO sending 'observation team' to monitor Eighth Amendment referendum ”. Feedback on “Canadian NGO sending 'observation team' to monitor Eighth Amendment referendum ”.